I had a chance to ask Lee a few questions about his BMX history. Q. Where was your first race and when? A. 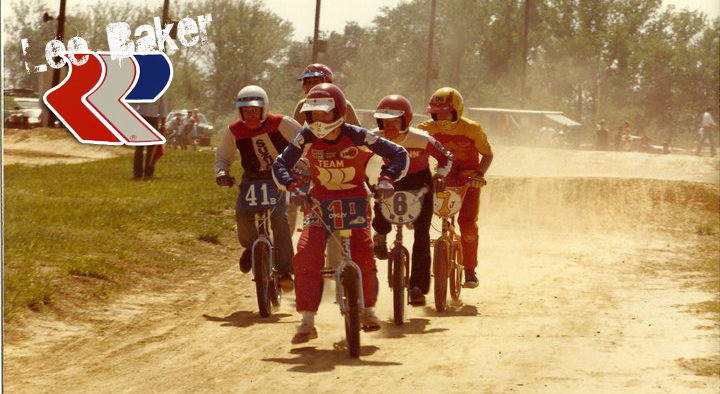 My first race was in March of 1977, at Burdette Park BMX, in Evansville, Indiana. Q. What bikes shops did you race for? A. My first bike shop sponsor was The Handlebar Bike Shop, in Evansville, Indiana. I got picked up by The Handlebar in July of 1977. In 1978, I rode for The Moped Center, in Evansville. Q. What were your favorite tracks? A. My favorite tracks were Knoxville, Tennessee and the Supercross track in St. Louis, Missouri. Q. What was your racing favorite memory? A. I really have two favorite memories. One of my favorite memories was beating Tim Judge for the first time during the pre-race for the National in Lawrenceburg, TN, in 1978. My other favorite memory is when Frank Nolte, who was a good friend of Chuck Robinson, called me to let me know that Chuck was going to pick me up. I had been holding an offer from Steve Johnson of Torker, and Frank made a call to Chuck. This all happened in February of 1979, and the rest is history. Q. Who were the fastest guys you raced locally? Or the legends from your home track? A. The fastest guys that I raced locally were Chuck Barton, who was NBL National 3, behind Tim Judge and Matt Workman, in 1977. Also Buddy Higgins. Q. What was your home track? A. My home track was Burdette Park BMX, in Evansville. Q What did you do after BMX? A. By the end of 1980, I’d been racing the NBL national circuit for the last 3 years and raced indoors in Indianapolis on the weekends during the winter for the last 2 years, I was disappointed with how my 1980 season ended up, so I was tired and ready to give it up. In 1982, I went into the Navy. After the Navy, I went to college and then to law school. I always looked back with regret for giving up on BMX. So, I got back into it in 2010. I race the 46 & over Expert class, where my national rank is #16, and the 46-50 cruiser class. I’m sponsored by SSquared Bicycles and Answer BMX USA. It’s great to be back on the gate with old timers like Eric Rupe, Danny Wall, Turnell Henry, Billy Griggs, Greg Hill, Harry Leary and a bunch more. I’m having a blast. One of the highlights from last season was my old teammate, Mark Wegener, coming out to watch me race at Powder Springs, Georgia. 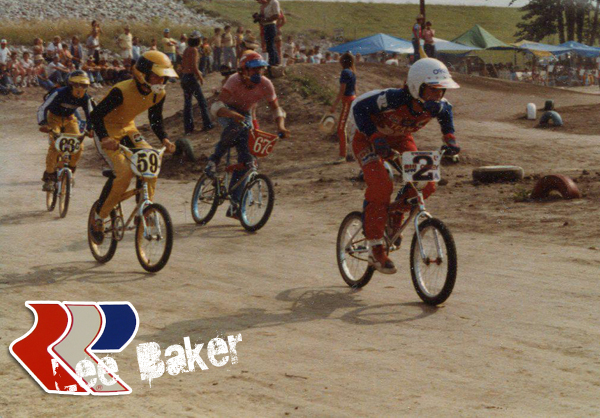 Early 1980, hammer down and rambling into the lead is Lee Baker #1 in Henderson, Kentucky. #41 is Chuck Barton and #6 is Mike Fowler. Lee was a 15 yr old expert until October 1980. Mid-1980 at Evansville, Indiana. #6 is Mike Fowler. 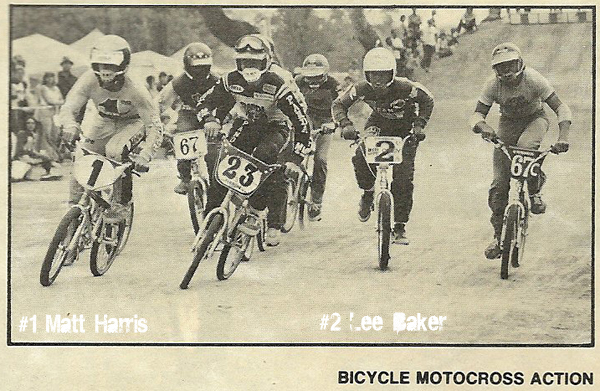 Mike was NBL National # 6 (14 yr old Expert) and Lee Baker was National # 2 for 1979 (14 yr old Expert). In 1980, Lee ended up NBL National # 8. Lee was in position for a chance at National #1 going into the NBL Grand Nationals at #4. But he failed to make the main and finished the year at NBL National # 8. More on Lee in a future post, including more pictures. Chuck Robinson made a name for himself as the Team Manager for Webco and later DG. But when he wore the big hat at Robinson he had to have help running the team. If you can add details or bios on any of these guys please do. Was Mrs. Hatfield a TM at one point? Just a couple image from the 96 catalog. I will add more later. The MX, SST, Pro and Rebel were all the same exact size and geometry. But the Rebel was TriMoly I think and the other 3 4130 frames. 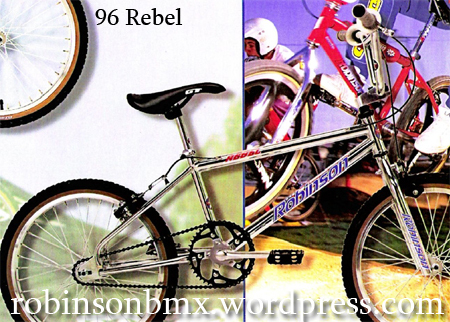 I believe the Pro, SST and MX all had closed looptail, while the Rebel was not closed in 96. The SST and MX appear to be almost identical. Perhaps one had a mild steel fork or different rims. But for the most part the same exact parts group. Ok once you have the year figured out, should be pretty easy since most frames are date coded in the serial number. You may not have the correct decals or remember which ones were used. Remember bikes made late in the year were usually the next years model. So if your bike was made say 1089, it could very well be a 1990 model. You may have to look at survivors and their SN or tiny details in the frame or parts group to be certain. This list shows you the correct decals for the different year Robinsons. As always a work in progress. If you find a Robinson with no decals, this will hopefully help you ID the model or year. GT owned (made?) 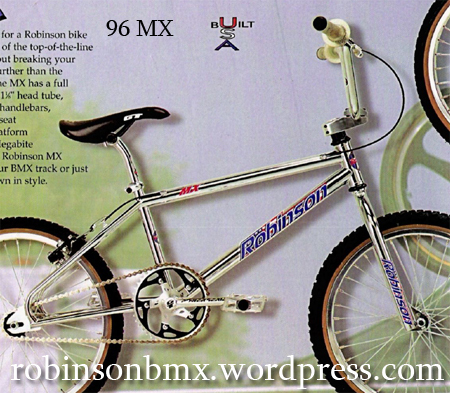 Robinson’s had a plate welded to the frame’s seat tube with Robinson logo stamped. Early GT owned Robinson’s were a full looptail and were made in 1987 and 88. Second generation GT/Robinson’s had a semi looptail starting in 1989? 94 Notes* All frames USA made and 4130. SST frame fake looptail does not close.